Earth Day Network: Participate in a Coastal Cleanup Event Today! Saturday, September the 15th is World Cleanup Day, and millions of people worldwide will take part in removing plastic and other types of waste from the world’s coastlines, rivers, parks, cities, and trails. 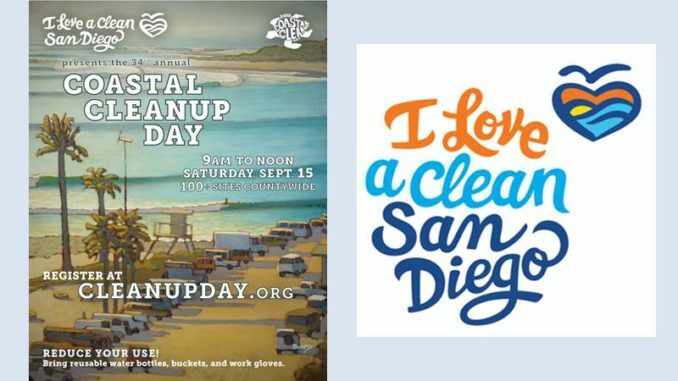 On Saturday, September 15, from 9 AM – 12 PM, thousands of volunteers in San Diego will participate in I Love A Clean San Diego’s (ILACSD) 34th Annual Coastal Cleanup Day (CCD) events. And many will be helping with cleanup and brush removal at Nobel Park, 8810 Judicial Drive, and surrounding areas. The main cleanup will take place in the park, but volunteers are able to head out into the neighborhood to collect litter from that main staging area. To register for the Nobel Park site, visit http://cleanupday.org/cleanupsites.htm?ID=C&ID2=846. Once the volunteers have registered, they will receive a confirmation email with all the details and a follow-up email with more information.